The general belief surrounding black holes is that they’re massive, but vicious matter gobbling cosmic objects. While it’s true the reputation of black holes as destroyers precede them, we should not forget that they fill an important role in the Universe as creators. Scientists now know that black holes are inexorably linked with galaxies, lying at their center and directly influencing how large a galaxy may grow. These aren’t your ordinary stellar variety black holes whose mass is just a couple of times that of our sun. No, these are classed as supermassive black holes and can have millions or, in some extreme cases, billion solar masses. Our own galaxy, the Milky Way is no exception. How can scientists, however, know this for sure? 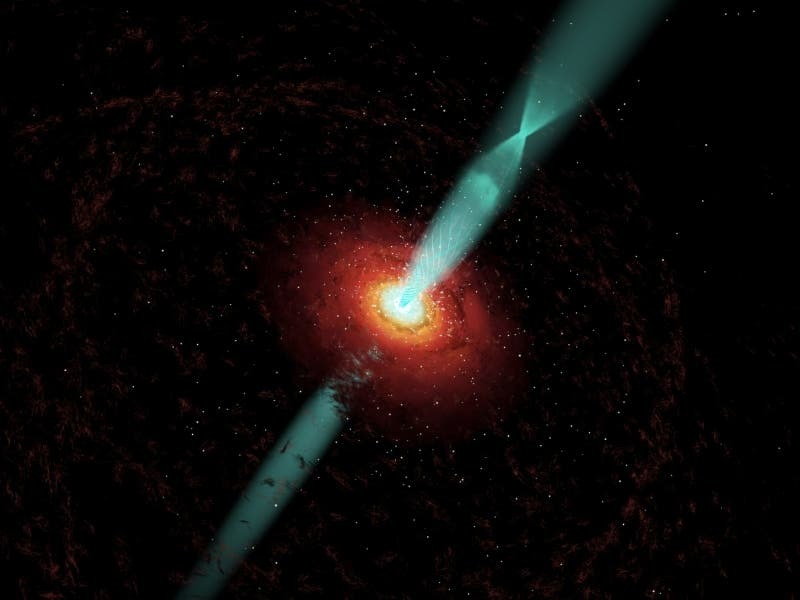 After all, you can’t directly observe a black hole, since it captures everything in its vicinity with no exception and this, of course, means light as well. No problem, you can infer it’s there simply by studying the environment around it. For instance, a group of researchers at UCLA have released some videos showing how a group of stars in the immediate vicinity of the Milky Way’s center (for the sake of argument, we first presume that we don’t know that there’s a black hole there). To observe these orbits, the astronomers had to first peer through the location in the far end of the red spectrum, as typical optical observations are obstructed by thick clouds of gas and dust, as well as the brightness of the stars themselves. A lot of stars were then seen orbiting around … something that didn’t emit any light. First hint there. It’s not enough to tell for sure, though. The best way to do that is to determine the size and mass of the object in question and if these correspond to those of a black hole, then it’s settled. How do you measure something that can’t be seen? You can’t see it, but you can feel it – the stars orbiting around it sure do, at least. By studying the ellipses of the orbiting stars, astronomers can know how large the object the bodies revolve around is – it has to be smaller than the narrowest part of the ellipse. Then, using mathematical relations derived from Kepler’s 3 laws of planetary motion you can find out how massive the object is. All you need to know is the orbital period of a star revolving around it, as well as the star’s distance from the object. Where T is the period, G is the Gravitational constant, M is the mass of the larger body, and R is the distance between the centers of mass of the two bodies. A 3-D video representation of the same orbiting stars around the ‘unknown’ massive object found at the center of our galaxy. Using such ideas and mathematical relations between various cosmic components, astronomers were able to infer how large and how massive the object at the center of our galaxy is. The object is likely 4.1 million solar masses, and 6.2 light hours in diameter (roughly Uranus’ orbit around the Sun). Undoubtedly, something this massive, yet tiny with respect to its mass, can only be a black hole – a supermassive black hole. 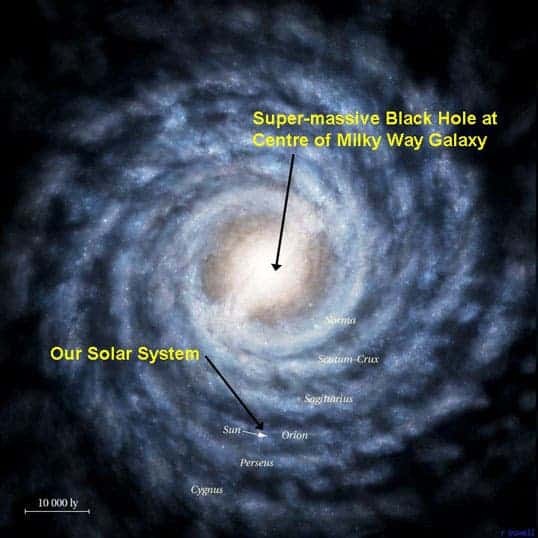 So, that’s settled – we now know for certain there’s a supermassive black hole at the center of the Milky Way, but how does it influence our galaxy and all the other for that matter? Almost a decade ago, researchers calculated that the mass of a supermassive black hole appeared to have a constant relation to the mass of the central part of its galaxy, known as its bulge (think of the yolk in a fried egg). This 1 to 700 relationship supports the notion that the evolution and structure of a galaxy are closely tied to the scale of its black hole. Another important relation that was observed is that the mass of a supermassive black hole greatly influences the orbital speed of stars in the outer regions of their galaxy: the larger the black hole, the faster the outer stars travel. We still don’t know enough about black holes, but from the little scientists have been able to study and gather about them, it’s beginning to be rather clear that black holes play a fundamental role in the formation and evolution of the Universe we inhabit today. You wouldn’t be wrong in saying, for that matter, that we wouldn’t be here in the first place if it weren’t for black holes. For more, check out our list of amazing black hole facts.